NASA astronauts Drew Feustel and Ricky Arnold quickly installed new wireless antennas and removed leaky hoses from a radiator. They also replaced a broken camera. "We got a lot done today," Mission Control radioed, offering congratulations. The astronauts brought the old equipment inside for eventual return to Earth. 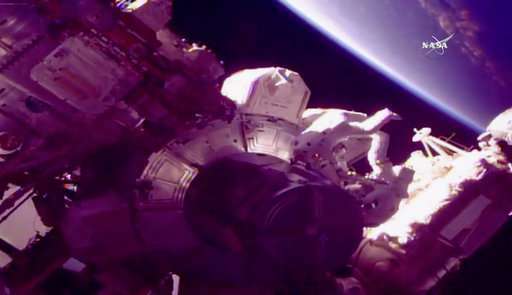 It was a tight fit inside the airlock as the spacewalk concluded at the six-hour, 10-minute mark. The spacewalk was planned for 6 ½ hours, but NASA decided to limit the men's time outside because of an issue with Feustel's air-cleaning system. They still managed to complete all their tasks and tackled an extra chore. NASA stressed Feustel's suit issue was unrelated to the trouble he had earlier in the day. His suit failed three leak checks after he put it on, but passed on the fourth try. That put the astronauts more than an hour late in getting outside. 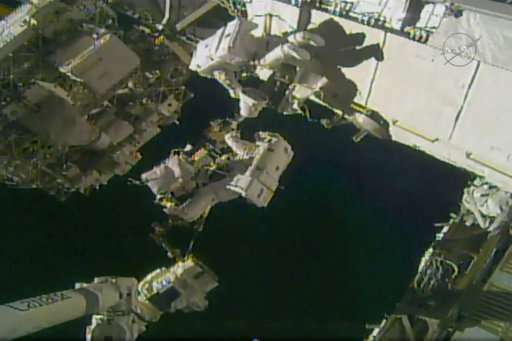 "You guys are working harder up there today than in the gym," Mission Control said before the spacewalk had begun. Feustel and Arnold rocketed away from Kazakhstan last Wednesday and arrived at the 250-mile-high outpost two days later. They will remain on board until August. Shuttle astronauts often went spacewalking a few days after reaching orbit, given their short flights, but it's less common for station residents who spend five to six months aloft. A space station manager, NASA's Kenny Todd, said earlier this week that both Feustel and Arnold were experienced spacewalkers from the old space shuttle days and were used to a quick transition in orbit. But Todd cautioned there's nothing routine about spacewalking and is probably the most dangerous undertaking by orbiting astronauts. This was Feustel's seventh spacewalk and Arnold's third. The intense pace continues next week. SpaceX plans to launch a load of supplies to the station crew Monday from Cape Canaveral, Florida.